FORT LAUDERDALE, FL – Thomas Legner is General Manager of The World. In this role he is responsible for overseeing the day-to-day management of the entire hotel operation on the largest privately-owned residential yacht on earth. Mr. Legner directs the staff in all Hotel departments (Enrichment, Food & Beverage, Front Office, Hotel Administration, Hotel Stores, Housekeeping, Human Resources, Laundry, Retail, Sales, Spa and Sports & Fitness) to ensure the delivery of exceptional and personalized service to all Residents and Guests. He also works closely with the Captains and other executive and senior management officials. 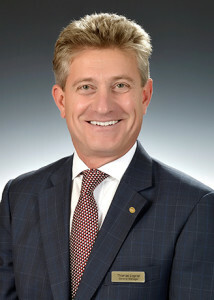 Mr. Legner graduated from the Hotel Management School in Vienna, Austria, and completed Cornell University’s Professional Development Program, Four Seasons Hotels & Resorts Personal Leadership Effectiveness Program, InterContinental Hotel’s General Manager Development Program, and various other strategic management and communications programs. Mr. Legner has proven leadership experience within the luxury hotel industry. Prior to joining The World he served as general manager of the InterContinental Hotel in Vienna where he had responsibility for all commercial and operational aspects of the property and led 15 departments. He also served as hotel manager for 450 employees at the Four Seasons in Washington, D.C. where he had direct oversight for the Engineering, Food & Beverage, Front Office and Concierge Services, Housekeeping, Laundry, Retail, Safety & Loss Prevention, and Spa & Health Club departments. He has also held management positions with Four Seasons Resort Nevis, Four Seasons Hotel Toronto and Silversea. Born in Austria, Mr. Legner has both Canadian and Austrian citizenships, and is fluent in English and German. He is married and has two children, a daughter, age 9, and a son, age 8. His personal interests include: hiking in the Austrian Alps, biking, classical music, enjoying good wines and most of all, spending time with his family.